Being born and raised in New Orleans, makes me a stickler for tradition. Every year around this time, I hunt high and low for King Cakes – the best of the best. Considering I now live in Houston, most of the time I have to settle for sub par King Cake. ::shivers::: Ugh. King Cakes are like a gigantic twisted or braided doughnut, top with Purple, Green, and Gold sugar and icing. And it comes in so many flavors. The traditional flavor is cinnamon. But I have eaten it with cream cheese, berries, pralines, and even chocolate! Target in Houston carries an assortment of King Cakes for CHEAP – $5 a cake that feeds 4-6 people. Not bad. 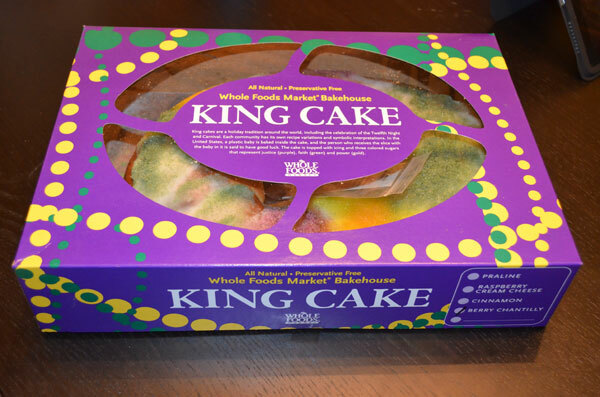 This year I purchased my first King Cake (we eat a cake each week) at Whole Foods. I just thought Whole Foods = more healthy? I have to keep my New Year’s dieting resolution in check somehow. I purchased a Berry Chantilly flavor which was filled with cream cheese, strawberries and blueberries. Delish! But only I ate it. My husband didn’t like the berries. He rather eat traditional. 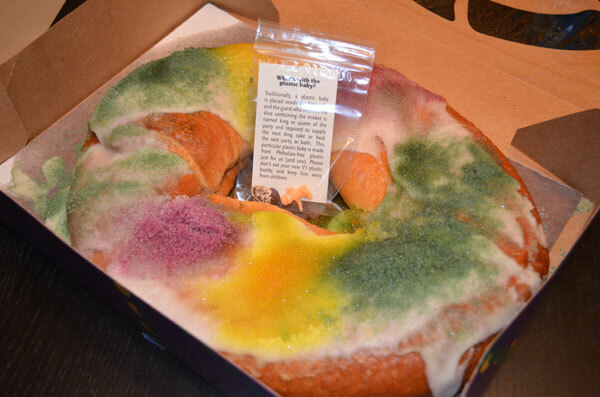 So this upcoming week, I’m in search for a traditional flavored King Cake.